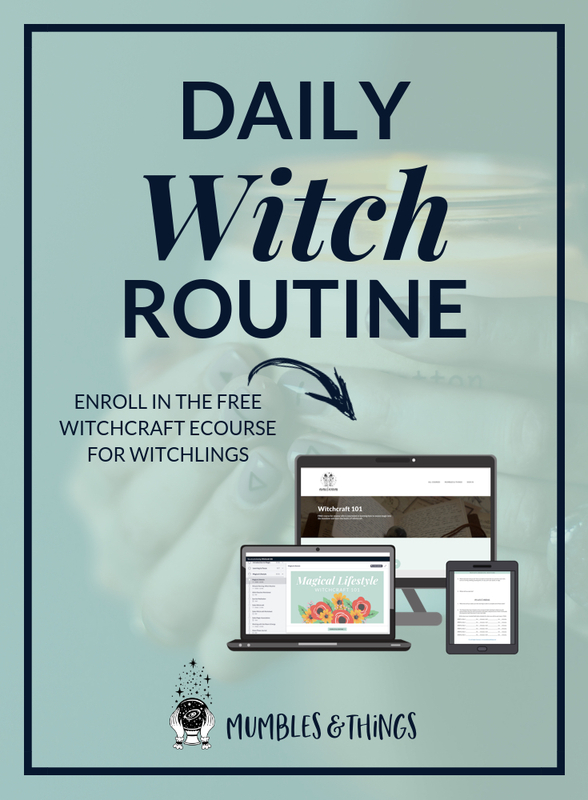 Miracle Morning: Start your Day the Witchy Way! Have you heard of the Miracle Morning? If you haven't let me tell you a little bit about it. In the time since I heard of it four years ago, it has really made a huge, positive impact on my life and I think it could help you too. The Miracle Morning is a book and a lifestyle, which helps you design a more productive morning routine. Try waking up earlier and following the steps laid out in the Miracle Morning. "How you wake up each day and your morning routine (or lack thereof) dramatically effects your levels of success in every single area of your life. Focused, productive, successful mornings generate focused, productive, successful days—which inevitably create a successful life—in the same way that unfocused, unproductive, and mediocre mornings generate unfocused, unproductive, and mediocre days, and ultimately a mediocre quality of life. By simply changing the way you wake up in the morning, you can transform any area of your life, faster that you ever thought possible." That sounds pretty great, right? The Miracle Morning is designed to help you do these things successfully. I, myself do The Miracle Morning most days and I feel like it's a great way to structure your mornings, to add purpose to your day, and to get more done throughout the day. Before we get more into the routine, I want to share a little background about the author, because his story is fascination. After being declared dead from a car crash for 6 full minutes, and being told he’d never walk again, he miraculously healed, and after even more ups and downs, he developed this morning routine. Generally, The Miracle Morning is a six step routine that is based on the concept of habit stacking. Habit stacking is when you pick several habits that you want to practice, and make a sequence out of them. Eventually the sequence itself becomes it's own new habit. The benefit of habit stacking is that you can adopt multiple good behaviors at once. You automate your behavior to do the entire sequence, which takes less motivation than if you were to practice multiple habits individually. The author, Hal, recommends completing The Morning Miracle sequence in an hour. Because of this, he recommends actually waking up an hour earlier than you normally would so that you can complete the full routine. If that sounds like the worst thing in the world to you right now, I challenge you to give it a try. You'll not only get used to that earlier wake up call, but the way you spend that hour will be more than worth it. These activities really structure your day in such a positive way. When you read only the first letter of each word, it spells out SAVERS, which is an easy acronym to help you remember. You can change the order of the sequence and adjust the times you want to spend on each item according to what is most important to you. If you don't have a full hour, you can even shorten the sequence to as little as one minute for each step (but try to get the full hour as often as possible). I'll explain each step in the order I do them, with examples of how you might spend your time. Then, I will provide a few examples of how you might alter them to make them witchier. 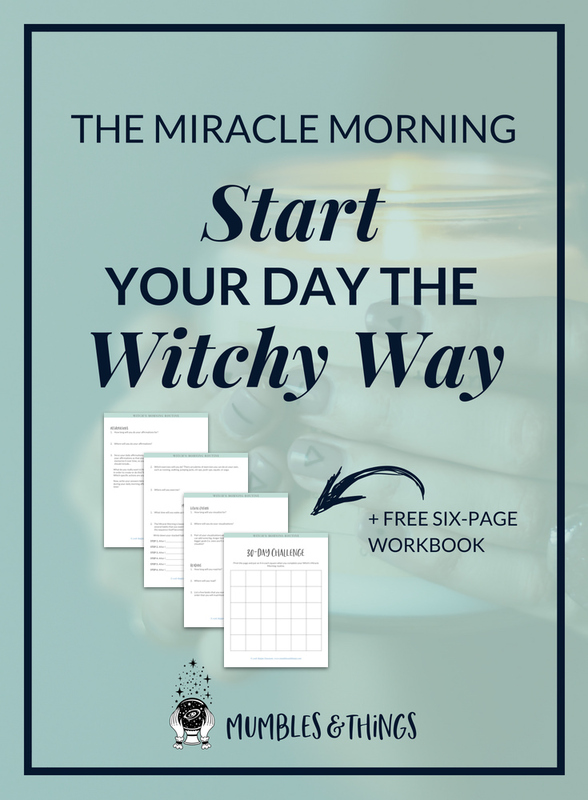 You can also download The Witch's Miracle Morning workbook to learn more about each of these steps and plan out your own. I also like to splash water on my face to wake myself up a bit and wash the sleep away. As soon as you wake up, your brain starts thinking. The point of this step is to start your day with a fresh relaxed mind. Meditation is a great way to accomplish this. I like to start my Witch's Miracle Morning with 13 minutes of meditation at sunrise. You can check the exact time of the sunrise in your area online or in an almanac. Start by reminding yourself gently, "After I meditate this morning, I will recite my affirmations," (or whatever your next step is). Set a timer for twenty minutes (or your desired time of silence). Make sure the alarm sound is gentle so that when it goes off, it doesn't jar your newly relaxed mind into anxiety. Settle yourself comfortably, facing east. I recommend sitting but you can stand if you like. It's best if you can actually see the sun rising, so if possible go outside or settle by an east-facing window. Light a white candle. The flickering of a candles flame can often be helpful when trying to calm your mind. Anytime you feel your thoughts starting to wander, refocus your gaze on the flame. As the sun rises, close your eyes. Let the sunlight wash over you. Bring your attention to your breath. Breathe in through your nose and out through your mouth. Take several deep and slow breaths in this way. Develop a pattern, timing each inhale and exhale to find what works best fo you. When your desired meditation time is complete acknowledge the space you made by saying some form of thank you or using a hand gesture. For example, you may say, "Blessed be," or make prayer hands and bow. This is optional. You may just want to flow right into the next step without transition. Leave the candle lit for your affirmations if you desire. Otherwise don't forget to extinguish it. Note: Some people make the mistake of considering their meditation practice successful only when they stop thinking. This is an incorrect belief. No one can stop their mind from thinking. Let me say that again because it's really important: NO ONE can stop their mind from thinking. Meditation is successful if it helps you focus your attention on one thing. It increases your ability to push away unwanted thoughts and focus only on the thing you want to give your attention to. Close your eyes and breathe, pay very close attention to your nostrils flaring, your chest rising, and your heart beating. The beauty of this 1-minute-meditation is that you can do it anywhere. At any time. If you feel stress rising throughout your day. Give yourself one minute of focused breathing to realign your thoughts. Affirmations are super cool. If you've ever made a jewelry purchase from Mumbles & Things, you have received a personalized affirmation written just for your item. If you don't know what affirmation are, they're basically self-fulfilling prophesies. They help you to build your self-confidence. An affirmation should be about something that you already believe or want to believe about yourself. They help you to visualize your future. They also help you to take action today to develop the skills you need to achieve your long-term goals. Make sure you choose empowering words, and not limiting ones. For example: say, "I won't," instead of, "I can't," and "Next time," instead of, "If only." What do I want? - this forces you to tell yourself what your future looks like. Why do I want it? - this reminds you of your motivators and what is at stake. What am I committed to doing in order to get there? - this reminds you of the actions you need to take and the skills you need to develop in order to move forward. Handwrite a 4-5 sentence affirmation set and and keep it somewhere special. I keep them at my altar. Remind yourself gently, "After I recite my affirmations, I will visualize my day." Stand up straight, smile. I recommend looking at yourself in a mirror. Read a pre-written affirmation that tells you how awesome you are and how you are going to achieve all of your wildest hopes and dreams. This *is* the one-minute version. You are welcome to say your affirmations for longer, but one minute really is sufficient. Your affirmations usually make sure you keep your long-term vision in mind, and have an idea of what the end goal looks like at all times. Your visualizations help you take the baby steps you need to actually get there. You picture yourself doing the work that you have to do today, in order to make progress. Visualization cures you of being unmotivated. You will do the tasks because you already saw yourself do them. Now, it is okay to visualize yourself completing big goals, especially the feelings associated with completion. But it's most important to visualize the day ahead. Start by gently reminding yourself what is next: "After I finish visualizing my day, I will read for ten minutes." Move into the visualization by closing your eyes. Imagine the day you are about to have. See yourself doing each task and feeling the sense of accomplishment you get from completing a task. Just like with affirmations, this *is* the one-minute version. You are welcome to visualize for longer, but one minute really is sufficient. Reading allows your mind to move in new directions. It also has the potential to teach you something new or help you to connect with different feelings and emotions you wouldn’t normally feel throughout the day. Before I started doing the Miracle Morning, I didn't make time to read. This is really a shame, because I love books. I buy books all the time but for about five years, they were for decoration only. Yikes! The Miracle Morning pushes me to set that time aside to do something I really enjoy. Remind yourself gently, "After I finish reading, I will journal for ten minutes." Set a timer for 10 minutes. This one can be a little more urgent than the timer you set for meditation. If you even remotely like books, it's easy to get lost in the pages. I actually can't stop reading in the middle of a chapter, so I've learned how many pages I generally read in ten minutes. I measure this step by pages rather than by time. Before I start, I check where that many pages will place me. I'll read through the chapter closest to the number of pages. Hal recommends reading self-development books. I often read fiction because this is what I don't make time for. You could also choose to read books on witchcraft, folklore, or your religion. It's your time, read what will be most helpful to you. Blog posts are okay as well, but only if you find them the night before and print them out or save them to an e-reader. Don't give yourself the temptation to open email or Facebook. Don't waste your morning routine time surfing the internet. Don't even open your computer or phone until you've completed the routine. Reading for one minute is okay but not very fruitful. You might consider joining a community like Blinkist. This subscription site offers full book summaries (called blinks) that you can read in a minute. Each one has a key point so you'll be sure to walk away with insight. Cliffnotes has many free summaries as well, but they may take a bit longer to read. If you must shorten your reading to one minute, make sure you print the summary the night before or save it to your e-reader. This is my favorite step, but you may have gathered, I rather enjoy writing. Otherwise, why would someone continuously write a new blog post every week for almost two years? Journaling and writing is really good for you. I like to think about it like Albus Dumbledore's pensieve from the Harry Potter series. He is a brilliant man and brilliant men have many brilliant thoughts. From time to time—even when in the middle of conversation—Dumbledore reaches his wand to his temple and pulls a shining tendril of thought from his brain to store in his pensieve. This artifact is a basin that holds and stores Dumbledore's thoughts for later viewing and analysis. All those thoughts floating around in your head are cluttering up your ability to focus properly. Journaling first thing in the morning gives space to allow these thoughts out and make space for new ideas. It helps you to connect your thoughts and emotions on paper. Remind yourself of the next step: "After I finish journaling, I will exercise for thirteen minutes." (or whatever your next step is). Hal suggests using a two-column page with headers, "Lessons Learned" (these are reminders of things you have already achieved) and "New Commitments" (these are reminders of where you are headed next). Your learned lessons could be simple, like remembering to water the plants before they turn brown, or complex, like profound insight you received from talking with a mentor. Your commitments are best to be small and limited to the day ahead. Your affirmations are for the bigger things. Try things like, "I will remember to drink ten glasses of water today." Or, a note to finish the next step on a project you are working on. A gratitude journal shows you that the little things in your life are actually quite big. To keep one, try writing down three things you are grateful for every day. This practice also shows you that there are good things everyday, even on days that feel not so good. Pro tip: There is a 30-days of gratitude worksheet in the Members Resource Library. I try to come up with different things for every day in a month. There are certain things that repeat, but even those differ slightly. For example, I am always thankful for my partner, but I will write down specific things he does for/with me like playing a board game or getting me nice cream. Use this time to work on your Book of Shadows. This is not necessarily a good time to research or take notes. Instead use it to reflect on your spiritual and witchy practice. You could try to bring meaning to a dream you just had. You could pull a tarot or oracle card and analyze what it means for your day (without looking it up in a book, use your intuition). Some of these have question prompts for you to answer, but if you don't want to purchase a new book or only do the one-sentence journal on days you are short on time, just make sure you answer this question: "How do I feel right now?" I finish my morning routine with exercise. This is mainly because I don't like to do anything when there is sweat on my skin. The previous five steps are designed to awaken your mind and your spirit, exercise will activate your body. It's not really enough time to do a full workout. You are just trying to get some blood flowing and raise your heart rate a little. Special equipment isn't necessary and you don't even need to go to the gym. In fact, don't go the gym, do this step at home. Pick 2-3 exercises from the list below and do the exercise 10-30 times. Select your exercises the night before and prepare anything you need to complete them. The miracle morning should be joyful. If the thought of these exercises is not filling you with joy, come up with something that does and also moves your body. Yoga is perfectly acceptable. You can take a walk around the block. However, I recommend that anything that requires you to leave your house be your last step in your Miracle Morning routine. Choose an exercise from the list and do only one set of 10-30. Step 1. Meditate at sunrise to focus your mind on one thought or idea. Step 2. Recite your affirmations to yourself in front of a mirror. Step 3. Visualize your day and imagine yourself working on and completing tasks. Step 4. Read for ten minutes to activate and inspire your mind. Step 5. Transfer your thoughts into a journal that you can reference and analyze later. Step 6. Exercise using only your body weight to get the blood flowing. By doing all of the steps involved in The Miracle Morning you're putting yourself in the right mindset to fully engage in your life and live it to the fullest. Here's the challenge I have for you. Try this with me for the next thirty days (at least!). It's 30 days of your life, what do you have to lose (besides a little sleep)? So make sure you download the worksheet and subscribe to the newsletter. You can keep me updated on how it's going for you and discuss with others in the Mumbles & Things Community Facebook group. Do you have a morning routine? Tell me about your practice in the comments below.